America’s involvement in World War II created many heroes, from the soldiers who fought on the beaches of Normandy to the assembly workers who made bombers and bullets. However, there’s a little-known aspect of our involvement that deserves more attention. During the war, there were roughly 70,000 men who registered as “conscientious objectors” through the draft service, of which 12,000 were assigned “alternative service.” This mostly came in the form of Public Service Camps, funded by pacifist institutions, that provided civic services like conservation, forestry, and public health to neighboring communities. While the treatment of some in the camps was not always ideal (some didn’t leave until 1947), there were some camps whose leadership ensured proper treatment of its staff. Camp No. 12 was open from June 1941 until October 1945. Its main task was “timber stand improvement,” described as “cruis[ing] through woodlots, survey[ing] timber, estimate[ing] yields and mark[ing] trees for cutting.” It had a rotating staff of about 35. One fun fact for us newspaper wonks is that the camp published its own newspaper, Cooperstown, from November 1941 to February 1943. Pacifism means hard work for the six young men spending a year at the American Society of Friends camp as conscientious objectors to the draft. They hack at tough brush with a heavy knife, eight hours a day, do kitchen police, wash their own clothes—and pay the government $35 a month. As eluded to earlier, the “Society of Friends” are the Quakers, a well-known American religious community that often claimed conscientious objector status in wartime based on their deep commitment to pacifism. The “camp” itself is an estate building lent to the Quakers and occupied also by members of their society. It is a large house surrounded by trees, flowers and shrubs. The director is Melvin Palmer, a biology professor on leave from Butler University. 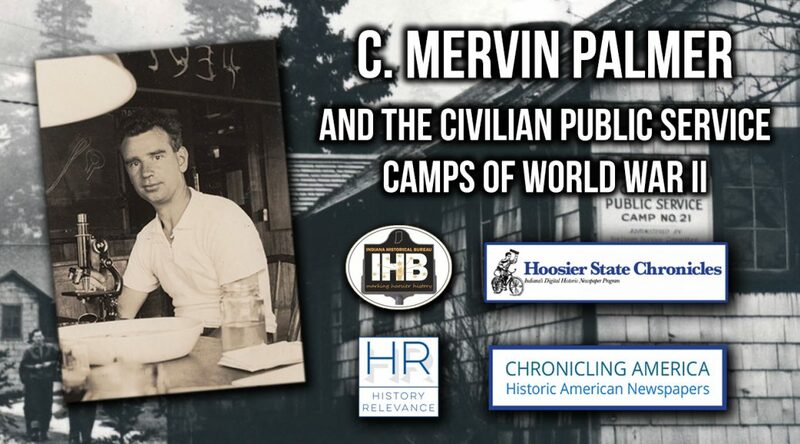 The professor incorrectly identified was Charles Mervin Palmer, who taught botany at Butler University, served as one of six directors of CPS Camp No. 12. Like his fellow campers, Palmer was a Quaker who’s religious and academic commitments urged him to join the CPSC during his academic sabbatical. Alongside his work with the CPSC, he provided his research on taxonomy and phycology (the study of algae) to the military during the war. After the war ended, Palmer continued his research on algae in India, publishing an article on his findings in 1950. Like Palmer, camp staff returned to their regular lives and jobs at the conclusion of the war. Despite the repetitive, menial tasks that staff completed at the camp, their service on the home front provided badly needed labor while soldiers fought abroad. These days, conscientious objectors often receive a bad rap, especially after the protests of the Vietnam era, but those that answered the civilian call to serve during World War II deserve our respect. Patriotism manifests itself in many ways, and the work of the Civilian Public Service Camps and Hoosiers like Palmer proved a unique, but equally vital part of the war effort. Heroes don’t always wage war; they also wage peace. Thanks for watching. Please click “like” in you enjoyed this video and make sure to subscribe to keep updated on all new videos. Finally, what does patriotism mean to you? What do you think the Civilian Public Service Camps tell us about American service today? Are there similar examples from your own experience? Leave your answers in the comments below. We want to hear from YOU.